Leavenworth Electric’s venture into the solar business three years ago is largely responsible for the growth in solar installations in Chelan County. 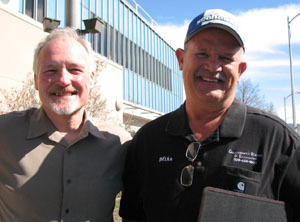 Electrician Mark Karnofski proposed diversifying with solar and owner Mike McComas quickly agreed. “Mark had such a heart for it,” McComas said, that he was easily convinced. Leavenworth Electric became an installer and distributor for Silicon Energy, the Marysville firm that gathers the components to manufacture the solar modules that now grace most of the newer installations in the county. Because Silicon Energy is located in Washington state, producers who use their panels are eligible for the largest state incentive available to individuals, 54 cents per kilowatt hour. Mark Karnofski, left, and Mike McComas have set up Washington-made solar modules and inverters at about a dozen homes in Chelan County. Payments from Chelan PUD’s Sustainable Natural Alternative Power (SNAP) program are “the cherry on top of the cake” for these producers, Karnofski said. Leavenworth Electric has completed about a dozen installations in Wenatchee, Manson, Cashmere and Leavenworth and has been tapped as the contractor for the proposed 14-kilowatt, 72-panel community solar project at Icicle River Middle School. The average size of Leavenworth Electric’s installations is 24 panels. “We can design a system to fit your budget,” McComas said. Installed cost is $7 to $8 per watt. So a 24-panel configuration that generates 4800 watts would cost $33,600 to $38,400. Spendy, but investors expect to recoup their costs and more due to the state and SNAP programs, McComas said. The state’s Renewable Energy System Cost Recovery Program is set to expire in 2020 but could be extended by the Legislature. The SNAP program has no expiration date. Silicon Energy panels come with a 30-year warranty. Leavenworth Electric contracts with Mark Pulse Construction to build the handsome structures that hold the panels, including artistic A-frames and deck coverings that meld form with function. Sixty-two sites are producing solar, wind and small-hydro power under the SNAP program. For a summary of activity in 2014, see our SNAP Annual Report.